Dear Diva, We’ve lived in our brand new house for five months and are really confused about what to do with our existing hardwood flooring. Here’s the problem: we have a light toned existing hardwood floor in the kitchen and we think the shape is odd. We’d like to make it flow better by adding more in the hallways and dining room. Is it possible to add new flooring right along the existing flooring in an attempt to improve flow? And if so how does this affect the carpet throughout the rest of our house? Carpet to hardwood flooring, can it be done? Thanks. Congratulations on the new house! And in answer to your first question, yes you can add new flooring right along the existing flooring. I’d suggest doing that as soon as possible if you want to find matching wood flooring. If possible, ask the builder which brand and style they used because trying to match from scratch isn’t as easy as it looks. If you can find the exact same wood flooring, you are in the home stretch and now just need to install the floor or hire someone to do it for you. If that flooring is not available or can’t be found, you will need to try and find a match. 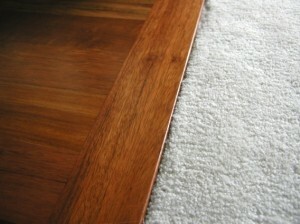 For that situation check out this article matching wood flooring. As for your other question about the wood floor affecting the carpeting, yes, installing wood floor where it meets carpeting will take some skill. You will need to have a new transition strip in the areas where it used to be carpet to carpet. And it is possible you will need to have the carpet re-stretched. Other than that is completely acceptable to have hardwood in some areas and carpet in others. 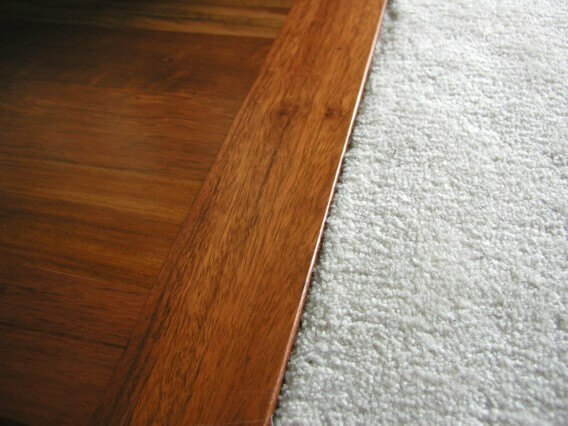 Having more areas in hardwood will also increase the value of your home.